Instead of approaching amputation with trepidation, 23-year-old Joe Pleban armed himself with humor, as evidenced by his Facebook page, "The Last Adventures of Joe's Left Foot." 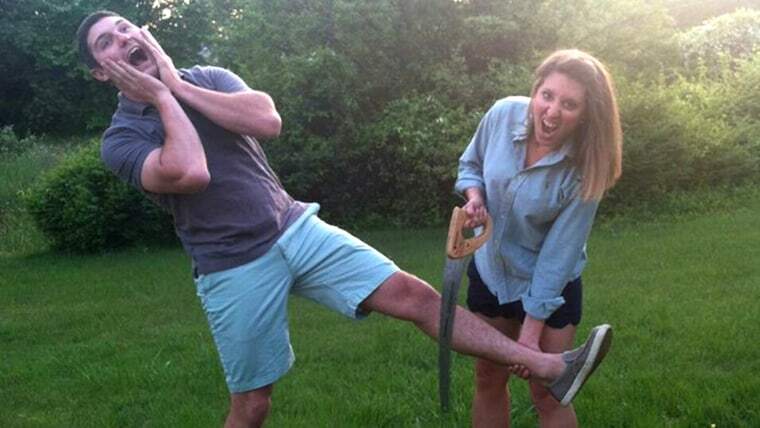 Consider his short-lived ankle tattoo, "Please Cut Here," which he got to lighten the mood. “We kind of decided that if I'm going to do a Facebook page about amputation, we might as well have fun with it,” he told TODAY.com. The Virginia resident had endured three leg surgeries in as many years due to a rare joint disease called pigmented villonodular synovitis, which caused benign tumors to develop in his left ankle. The chronic injuries were hampering his active lifestyle, which included running, rugby and snowboarding. Knowing there may be no end to the surgeries otherwise, Pleban asked doctors to amputate his left leg below the knee. When he scheduled his surgery for June 25, he had a month remaining with his left leg intact, so he and his girlfriend, Johnna Hetrick, 27, created a bucket list of activities and destinations, including a skydiving adventure, a paintball excursion, a music festival and a Caribbean vacation. In the interest of keeping his friends and family members in the loop without having to reach out to them separately, he created his public Facebook page, where he posted pictures of his adventures. But the popularity of the page, which now has more than 7,400 fans, may have more to do with Pleban’s sense of humor. Photos show a tattoo artist inking inking a dotted-line and the words “Please Cut Here” on his left ankle; Hetrick pretending to cut his leg with a handsaw; and a man in construction gear feigning the same act with a circular saw. The growing popularity of the Facebook page became only made Pleban more motivated to spread a message of positivity. Hetrick, who’s known Pleban since high school, told TODAY.com she’s been inspired by her boyfriend’s message. “It’s amazing just seeing how positive he is, and how he doesn’t let any of this stop him from doing anything,” she said. Pleban thanked his own mentor, Tony Meehan, for helping him endure the emotional and physical tolls of the surgery and its aftermath. Meehan also has an amputation below the knee. Despite the confidence he had in his decision to amputate, Pleban admitted he’d been anxious about it. Pleban said his surgery at Georgetown University Hospital was a success, and his leg does not appear to show any signs of the disease that had plagued him for years. Hetrick said sharing the experience with Pleban has strengthened their relationship, now in its sixth month. With the approval of his doctor, Pleban plans to start getting fitted for a prosthetic Monday. And, thanks to users of the webpage Reddit, fans of his story already have chipped in via a Crowdtilt campaign to pay for a prosthetic leg cover. Pleban said he plans to start running, snowboarding and playing rugby again soon, even if doctors advise him to be patient with the rehabilitation process.